Westlake Chemical is upgrading its production facilities and entering new markets with its latest acquisition. The company has a solid history of revenue growth and its earnings have trended higher. The stock is reasonably priced and pays a 1.4% dividend. Westlake Chemical is a financially strong company giving patient investors a long-term investment at a reasonable price. Westlake Chemical Corporation (NYSE:WLK) has produced strong revenue growth over the last decade and more growth is forecast. The company operates profitably with strong returns on equity and decent profit margins. Over the last decade, the company’s profit margins have averaged over 10% and its return on equity averaged around 20%. The company is financially sound with moderate debt levels and ample working capital. Westlake Chemical’s total debt is currently 48% of the value of its assets and it operates with a generous amount of working capital (with a current ratio of 2.4). The company can easily pay its bills with its working capital rather than having to dip into its long-term debt. With the moderate total debt level, the company can easily take on more debt if needed (for any future capital expenditure plans the company may have). I prefer companies that have a total debt that's under 50% of its total asset value - as this gives the company plenty of leeway before debt becomes excessive. When debt levels rise, so does the bankruptcy risk which is something I like to avoid when investing with a long-term view. Westlake Chemical pays a dividend with a forward yield of 1.4% and a trailing yield of 1.2%. The company is paying out 12% of its profits as dividends. With a stock price of $77, Westlake Chemical’s forward PE multiple is 9.1x. The company’s trailing PE multiple is 10.2x and its book value multiple is 1.8x. These multiples imply that Westlake Chemical is reasonably priced. Westlake Chemical has a strong history of growth with its revenue increasing 16% per year over the last decade. The chart below visually shows Westlake Chemical’s revenue and earnings trend over the last decade along with the next two years of consensus forecasts. As the above chart shows, Westlake Chemical has a history of increasing its revenue. The company’s revenue surged higher in the 2017 fiscal year as a result of its acquisition of Axiall Corp. in 2016. The forecast revenue shows the growth trend from 2017 continuing into 2020. Westlake Chemical’s earnings have also increased over the last decade, but the earnings trend shows some volatility. The forecasts show the company’s earnings volatility to continue with an earnings dip in 2019 before recovering in 2020. Westlake Chemical has increased its global presence with the recent acquisition of the French-based company NAKAN which generated $300 million in revenue last year. The acquisition cost Westlake Chemical $265 million in cash and the deal closed at the start of 2019. While the price paid is fairly expensive with a Revenue/Price multiple of 1.1x, the acquisition has effectively expanded Westlake Chemical’s global operations. NAKAN has eight production facilities located in China, France, Germany, Italy, Japan, Mexico, Spain and Vietnam. I think the NAKAN acquisition was a good business move which will boost Westlake Chemical’s growth. NAKAN opens new markets such as Vietnam and China, and new markets in Europe where Westlake Chemical had no production facilities. Albert Chao - President and CEO, stated in the recent earnings call that the NAKAN acquisition will contribute to Westlake Chemical’s profits for the 2019 fiscal year. Westlake Chemical is experiencing increased global demand for its major products including polyethylene, PVC resin and caustic soda. The company’s investments to improve the reliability and operational efficiency of its production facilities will allow Westlake Chemical to fully benefit from the increased demand. Two of the plants are located in Germany with one expected to be completed this year and the expansion for the other will be completed by 2021. Their U.S.-based plant in Louisiana is also being upgraded and is expected to be completed this year. While these plant upgrades cost money, they are a necessary expenditure. The benefits will start to be reflected in increased production starting from 2019. I personally think that upgrading ageing plants is a good investment for the future. Spending money on increasing the company's production efficiency will lead to lower production costs and even more importantly the company will more readily be able to fulfill its orders. Companies that can't meet client orders in a timely manner is a prime reason why client businesses look to the competition. Westlake Chemical faces plenty of competition. 1. Competition for their Vinyls market includes Formosa Plastics Corporation, Oxy Chem, LP, Shintech, Inc. amongst others. 2. Competition for their Building Products market includes Diamond Plastics Corporation, JM Eagle, Ply Gem Holdings, Inc. amongst others. 3. Competition for their Olefins market includes Chevron Phillips Chemical Company, The Dow Chemical Company, Exxon Mobil Chemical Company, amongst others. The markets that Westlake Chemical operates in are highly competitive and as such I think it’s important that Westlake Chemical maintains its competitiveness with reliable and efficient production facilities. I like that Westlake Chemical is positioning itself for future growth, even though I think that the company’s earnings will remain somewhat volatile. Since plastics are made from oil, the plastics industry faces a highly volatile input cost for its raw material. So investors considering investing in a plastics-producing company need to be aware of the potential for earnings volatility. In my opinion, management has shown that they will continue to grow the company, as is evident from Westlake Chemical’s strong historical revenue growth over the last decade. Westlake Chemical has a history of revenue growth. While the company’s earnings are somewhat volatile, they have generally increased over the years with an average 10.2% per year growth rate since 2011. The PEG (PE divided by the earnings growth rate) can be used to arrive at a valuation based on its earnings growth. Including the forecast earnings gives an average 8.3% growth rate from 2011 to 2020. This leads to a forward PEG of around 1.2 with a 2020 PE multiple of 9.1x. It’s commonly accepted that a stock is fairly valued when its forward PEG is 1.0 which means that Westlake Chemical is slightly overvalued with a stock price of $77. Its fair value would be around $66. Over the last decade, Westlake Chemical’s stock price climbed strongly to peak in 2014 before pulling back. The stock bottomed in 2016 and rallied to peak at around $120 in 2018. From there, the stock pulled back to just above the trend-line (blue line on chart) formed since 2010. The two major pullbacks broadly coincide with the year following the two really strong earnings years shown on the earnings chart above. Westlake Chemical reported strong earnings for the 2013 fiscal year with an earnings drop for 2014 and 2015, and the stock price declined. Similarly, the company reported strong earnings for 2017 and an earnings drop for 2018 with lower earnings expected for 2019, and again, the stock dropped in price. Admittedly, the stock market itself pulled back in the later part of 2018. Nevertheless, the stock chart does highlight that Westlake Chemical is quite sensitive to its earnings results. In the short term, the stock will probably remain subdued as the 2019 earnings are forecast for a drop and the recovery is not expected until 2020. While I’m not expecting a big rally, it’s not out of the question either. If the stock market continues higher and breaks out to new highs (both the Dow Industrials and the S&P 500 have nearly reached their all-time highs), I would not be surprised if Westlake Chemical also rallies - to a certain extent. 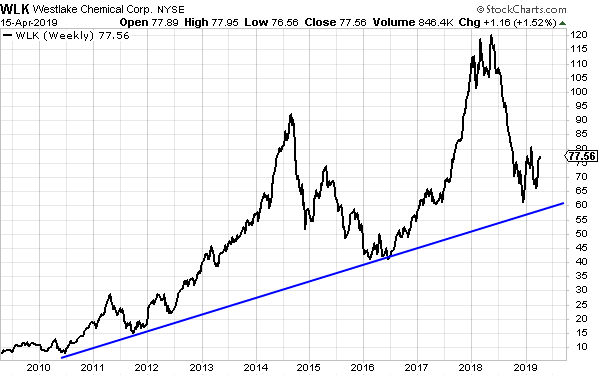 If the stock does rally, I would expect a more subdued rally like that from 2016 where the stock rallied from $40 to $60. This $20 rally when added to the current stock price of $77 gives a target of $97. Westlake Chemical has a history of volatile earnings. The stock is reasonably priced with a forward PE of 9.1x which will help provide some downwards protection. The trend-line may also provide additional downward support. Over the longer term, Westlake Chemical has the potential to continue higher, but I would expect the stock price to remain volatile. Westlake Chemical has been upgrading its production facilities in order to remain competitive. The NAKAN acquisition provides new markets for Westlake Chemical. The company is experiencing increased global demand for its products which I think will keep its revenue growth continuing into the future. The company operates in the plastics industry which uses oil as a raw material and as such its earnings will always remain volatile due to the volatility in oil prices. Westlake Chemical has a solid history of revenue growth and its earnings have broadly trended upwards. The stock is reasonably priced with a forward PE of 9.1x and a forward PEG of 1.2x. The stock pays a modest dividend with a 1.4% forward yield. The stock could suit value-oriented investors, but they would need to be patient as the stock price will likely remain volatile.